Jesuit values and Catholic doctrine are one and the same: they are inextricably linked, and to attempt to separate them is to destroy both. If you are not Catholic, then you cannot ipso facto be Jesuit. Furthermore, the lauded ideals of the Jesuits imbue us with a sense of wonder at the majesty of creation, with a sense of vocation, with concern for all of the human family, with tolerance and charity: these ideals are utterly Catholic, and you cannot be Catholic except that you hold and follow these ideals. Is this a call that all Boston College students be Catholic? Certainly not; it is simply to make clear that one cannot separate the Catholic identity of the University from its Jesuit identity. Furthermore, we must see this Catholic, Jesuit identity as a strength of Boston College, not a weakness. Our stature as a top-flight national University is, in fact, all the more reason for the University to stand firm in its ideals. A few decades ago, the theology and philosophy core requirements were reduced and the Crucifixes were removed from the classrooms in an attempt to make Boston College more appealing to the secular elite of national standings. This was a mistake. The time has come for the University no longer to bow its Catholic identity to the beliefs of a secular world just because it aspires to the top levels of recognition in that secular world. The time has come for this University to stand, as Fr. John McElroy, S.J., intended it, as an institution of higher learning true to the banner of the Catholic Faith. The University necessarily cannot reflect the views of all of its students by the very fact that not all of its students are Catholic. This, however, should not be seen as a weakness on the part of the University; rather, it should be considered a strong foundation, for the unique strength of Boston College is its Catholic identity. It is what differentiates Boston College from BU or Northeastern or Brown, and provides for us a firm moral foundation committed to the service in God’s name of others. Let us all learn from this identity, and act with the compassion and love our Lord taught to us, to His greater glory. As some of you may know, for my Senior Thesis I am writing an English verse translation of the late 12th-century German didactic poem Der arme Heinrich by Hartmann von Aue, accompanied by a commentary. As I complete the translation of each chunk of the poem, I have decided to post each one here so that you can read them and give me feedback on them. But first, some background. German vernacular literature experienced its first great Blütezeit in the period between ca. 1150 and ca. 1250, that is, under the Hohenstaufen dynasty of Friedrich Barbarossa and his successors. This period of literary output, all centered on the courtly society of the High Middle Ages, was to go unmatched in Germany until the Enlightenment under the likes of Goethe and Schiller and saw the production of such literary masterpieces as Das Nibelunglied, Tristan by Gottfried von Strassburg, and Parzival by Wolfram von Eschenbach. Two principle genres flourished under the patronage of the courts: Lieder, that is, songs; and works of epic. The Lieder were further categorized according to topic: political; courtly love, called minne; and Christian songs, especially focused on the Crusades, called Kreuzzuglieder. One of the great poets of this period was Hartmann von Aue (ca. 1160 – post 1210). Hartmann was an accomplished poet in both of these genres; his epic works (Erec and Iwein) are especially notable for, as adaptations of the Arthurian romances of Chretien de Troyes, a French poet of the previous generation, they introduced the Arthurian romance to Germany. In addition to his epic romances and his Lieder, Hartmann wrote three other works: Gregorius, an epic, mediaeval Christian Oedipus tale; Diu Klage, a lamentatio on the nature of minne; and Der arme Heinrich. At 1520 lines, Der arme Heinrich is far longer than any Lied, yet far shorter than his epics, e.g. Erec at over 10,000 lines. Furthermore, the subject matter of Der arme Heinrich is unique among extant literature of any author from this period. It is the story of a great knight, Heinrich, who excelled in every aspect of knightly virtue, in youth, loyalty, good breeding, charity: in a word, honor. His pride in these virtues, however, became excessive, and God punished him accordingly: Heinrich was made a leper. The story follows his journey as he falls from grace and searches for a cure: according to the doctors, only the beating heart of a virgin willingly sacrificed can cure him. Such a girl is found in the most unexpected of places, but Heinrich loves her too much to allow her to make the sacrifice; in the end, their devout love for each other saves them both. In some ways a mediaeval take on the story of Job, it is both a theodicy and a presentation of mortal moral strictures. It explores the conflicts between a mediaeval courtly society that values virtues of honor and pride, and a Christian call, omnipresent in that same society, to humility. While other works of the day, most notably perhaps Parzival, also deal with this dichotomy, Der arme Heinrich is unique in that it does not fashion itself within the romance epic genre. It is, rather, a didactic poem fashioned in the form of a prayer; the poem begins and ends with an exhortation to the reader to (1) pray to God for the soul of the poet and (2) to use this poem as a didactic tool in living a moral life. 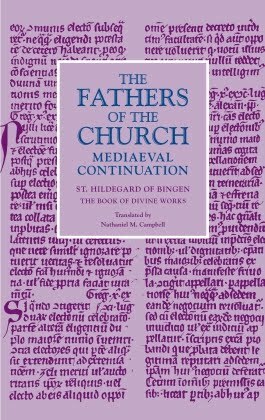 In this way, it serves as perhaps the most striking example of the intersection of secular and sacred in this period of High Mediaeval courtly literature. I present you now the first chunk of the translated text; if you are interested, the full Middle High German text can be found here, although it is not fully accurate to the most recent critical edition (which I am using); an online knowledge database can also be found here (it includes linear translation/grammar and context dictionaries). 5 Vassal was he to Aue’s lord. Varied volumes, some thick, some thin. 15 Himself among the folk loved well. A tale, one which composed he found. 25 To God hence for his soul’s probate. Whoe’er doth pay other’s sins’ fee. 35 Should for complete esteem possess. In ev’ry corner of the lands. 40 His virtues, too, were of great girth. As in bearing and dignity. To Aue Manor was he born. Until his end steadfast perfect. 55 His way of life and bloodline stood. With ev’ry kind of virtue clear. A complete crown of good breeding. Neither in want nor in excess. Of all honour upon his back. And sang full well of love a lay. The world’s great praise, glory, respect. He was courtly and circumspect. Into a humble life lowest. 90 As telleth us Holy Scripture. When we think we live all the best. 100 It is beyond our mastery. E’en while it doth a bright light burn. 105 We are of brittle substance made. When it most verdant doth appear. 115 He is ‘fore God a reprobate. Of him did leprosy take hold. Became he then quite repugnant. 126b Who one time the world’s banner bore. In the midst of his life’s fortune. I know that I haven't updated in a long time - in a really long time, in fact. I apologize for that, but events have conspired to leave me with literally no time to post. These events include but are not limited to: classwork (and far too much reading); extracurriculars (the most time consuming of late being The Observer and covering for it the extraordinary events of our time, e.g. the rise of racial tensions at Boston College sparked by an alleged "hateful incident" the night of the Virginia Tech football game, and racking my brain to come up with a solution to this terrible problem); and that omnipresent leviathan, my senior thesis, which could, if given the chance, consume every waking moment of my existence. 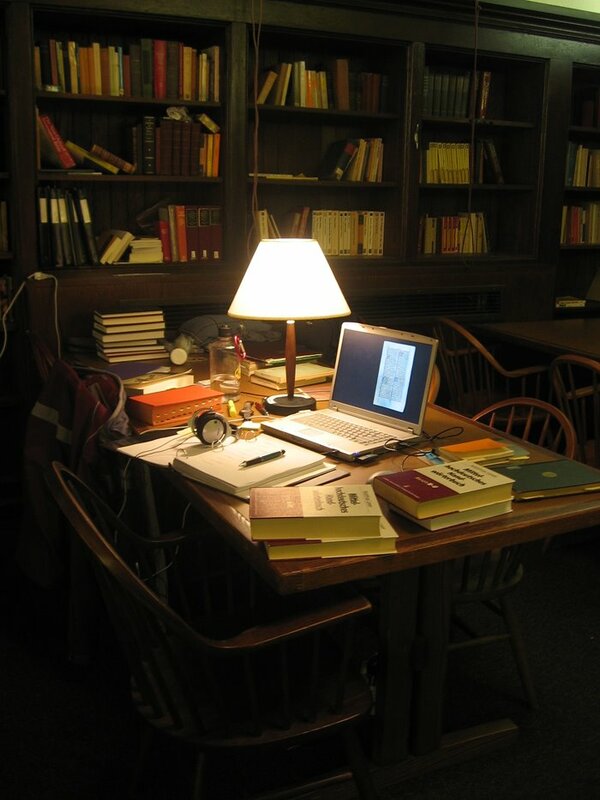 As some have asked, I have included with this a post a picture of my table in the Honors Library. For those of you who don't know, some say that I live in the Jenks Honors Library of Gasson Hall. It is true: I spend most of my time at this table, for I find the library's environment more conducive to studying than my dorm room - it has become rather like my "base of operations" if you will. Because the Honors Library is a private library of the Honors Program, it never closes, and, provided you get into Gasson Hall before they lock its doors at about 11:00 pm, you can stay all night if you'd like. I've adopted this table as my own, and in this photo, you see it decked out as it is often is when I'm working on my thesis. You'll note that the two shelves in the cases above it also contain my notebooks and books - because I have so many books and materials, it's far more economical just to reserve those shelves to my use than to lug all of it to and from campus every day. Quo modo differt homo sapiens? UPDATE: My response to this TIME Magazine story was printed amongst their Letters, available here and here. "Agriculture, language, art, music, technology and philosophy—all the achievements that make us profoundly different from chimpanzees and make a chimp in a business suit seem so deeply ridiculous—are somehow encoded within minute fractions of our genetic code. Nobody yet knows precisely where they are or how they work, but somewhere in the nuclei of our cells are handfuls of amino acids, arranged in a specific order, that endow us with the brainpower to outthink and outdo our closest relatives on the tree of life." I, however, am struck by one very bold assumption: that the answer to the great achievements of humanity must lie encoded in the amino acids of our DNA. Is it possible that the mystery of human thought and creativity is simply that: a mystery beyond our own comprehension? When I revel in a Mozart adagio or sit captivated beneath the ceiling of the Sistine Chapel, I wonder by the very fact that I cannot explain how Mozart or Michelangelo accomplished what they did. Genius amazes because it is a mystery: if you could explain to me why, after all these years, I keep picking up a book of Milton’s poetry, I would stop picking it up, because the wonder would be gone. P.S. I will have an update on my thoughts about the situation at Platte Canyon High School later in the weekend. The Lord, Holy Father, Almighty, Everlasting God is your King: the Kingdom of the Lord is at hand and you are His subject. Acknowledge God as your King: swear fealty unto Him. The Kingship of God is an aspect of His Being that many modern Christians rather lightly skip over. Especially in America, where concepts of individual sovereignty are innate, we do not respond well to the idea that we are complete and total subjects of a King: the Founding Fathers have bred in us a distrust of Kingship. But God is no "earthly king or potentate," as the Irish-American athlete and flag-bearer at the 1908 Olympic Games in London said. God is the eternal Lord of all creation: His authority is absolute over everything. As the song says, "He's got the whole world in His Hands": he is both a benevolent creator and an absolute monarch. He is the pantokrator, the one who holds all authority and power: in the West we think in terms of omnipotence, but the original Greek term indicates not so much supreme potential as it does supreme and absolute authority. God is King of all and holds all rights and privileges pertaining thereto. The most important of those rights and privileges is our fealty: we owe our allegiance, above all earthly loyalties, to God and God alone. Should your earthly fealties come in conflict with your heavenly ones, you have but one option: to walk steadfast in the Ways of the Lord. For example, your King commands that you respect all life: any allegiance you have to an earthly power that calls on you to disrespect life or to uphold the rights of others to disrespect life are null and void. Furthermore, it is on account of God's Kingship that we kneel before Him. Especially when we enter a House of God and come before His True Presence in the Sacrament of the Altar, we bend our knees before Him, acknowledging His preeminence and power over us. Likewise, during the Canon of the Mass, we kneel before him humbly in respect of the great mysteries occurring before our eyes. We, the subjects of the Lord, are unworthy that he should come under our roofs; yet He is a merciful God and has ordained by His mercy and His Word that we partake in His Kingdom. So swear your fealty to God: swear allegiance before Him, and acknowledge Him always as your King. Hymnus Per Diem: "Praise to the Lord, the Almighty"
"Students, faculty protest weapons" declares the front-page headline of today's Heights, while inside, the Editorial Board proclaims that "Peaceful protest makes clear point." These reference, of course, what has become a tradition at Boston College: the protest of aerospace and military contractors like Raytheon and BAE Systems by the Global Justice Project at Boston College's annual Career Fair. This is the third year that the GJP has organized to protest the presence of such firms at Boston College, citing a conflict with the university's Jesuit mission of promoting peace and social justice. In 2004 and 2005, the protestors were met with resistance from the university. This year, the university allowed the protest to go forward owing to the presence among the protestors of several faculty and Jesuits. Another "protest" that has become a regular part of Boston College life is the biweekly Boston College Pro-Life Prayer Vigil on the Dustbowl, which consists of several students praying a decade of the rosary in watch for the lives of the innocent unborn. Have these prayer vigils been covered by The Heights? No. Has the Editorial Board ever recognized these prayer vigils for being peaceful? No. Has the GJP ever recognized these prayer vigils as coinciding with the university's Jesut mission of promoting peace and social justice? No. In fact, the GJP has long supported pro-choice movements on campus, like the Women's Health Initiative, a group not recognized by the university, that attempted to hold events promoting "dialogue" (to which pro-life representatives were not invited) last year. That the pro-choice stance is counter to the Catholic values of Boston College doesn't seem to have entered their logic patterns, though they were quick to denounce the bestowal of an honorary degree last May on Secretary of State Condoleezza Rice as being counter to those same values. Some of you may remember that I wrote an article in The Heights two years ago criticizing the first of these protests at the Career Fair. I have been recently reflecting, however, on the nature of the call to protect all human life. For me, that call the past few years has expressed itself in being Pro-Life, i.e. being against abortion, euthanasia, capital punishment, and infanticide. My socially just passions cried out for the innocent, born and unborn; for the infirm (and increasingly disrespected) elderly; and for the souls of men who had sinned, for though we may punish them on earth, the punishment of death is reserved to God. But that passion has cried out for more. I distinctly remember sitting on the couch the summer before last watching the nightly news: the lead story was about the famine in Niger; it was followed by an Israeli soldier who blew himself up on a bus in Gaza; after the first commercial came the reports (daily then as now) of more deaths, both American and Iraqi, in Iraq. By the end of it, I was reduced to tears: what possible reason could we have to continue to inflict such violence against each other, or to neglect the poorest of the world? Today, while praying before Mass, the thoughts began to coalesce in my mind and in my heart: if I am pro-life, then I am for all Life. As I cannot countenance the destruction of a life in the womb, neither can I countenance the taking of an innocent human life by other means, whether it be by neglect (e.g. most of Africa) or by "collateral damage" (e.g. the continual conflicts in the Middle East). Furthermore, I have a responsibility not only not to countenance it, but to actively oppose it. Yet, I have started to feel that my responsibility goes even further. As I researched the origins of the First Crusade and of the idea of crusading this summer for my Mediaeval History course in Germany, I naturally had to read much concerning the development of the theories of "just" and "holy" war. The theology of war has its origin in the works of St. Augustine. He enunciated three criteria that define a “just” war: auctoritas principi, i.e. that the warring party must have the authority to declare and carry out war; the causa iusta, i.e. that the war must have a just cause and be carried out to right an injustice; and the intentio recta, i.e. that one must carry out the war with a just intention so that there are no ulterior motives and there is no other way through which the injustice can be righted. It is important to note that the end goal of a just war should be the establishment of peace. Under the reform popes of the 11th century, this idea changed. When in 1053 Pope Leo IX led an army against the Normans in southern Italy, the idea first appeared that men could engage in combat in defense of the Church. Later, under Alexander II, several secular rulers fought under the vexillum sancti Petri, the banner of St. Peter, e.g. Duke William of Normandy in England in 1066. Yet, even though he fought under papal authority, after the battle, every one of William’s soldiers had to go to confession and receive absolution for the sin of murder. Under Pope Gregory VII, however, appeared two evolutions in the theology of war without which the Crusades would not have been possible. First, Gregory morphed the meaning of the terms militia Christi, “the soldiery of Christ,” and milites Christi, “the soldiers of Christ.” These are ancient terms that appear at least as early as the letters of St. Paul, but previously they had always denoted the spiritual battle of the martyrs and monks: the exact opposite of worldly warfare. Now, however, Gregory spoke of a worldly aspect of the militia Christi: the defense of the Church through the now just arms of her secular faithful. Second, he began to speak of the so-called soldier-saints, e.g. St. Maurice, St. Sebastian, St. Gregory, or St. Martin, as no longer holy despite being warriors but as holy because they were warriors. Therefore, a man who receives absolution before battle, kills men during the battle in defense of the Church, and then dies himself, dies not a sinner but a martyr. Essentially, it was not longer a sin to kill enemies of the Church. All of this is to say, then, that while doing this research, it occurred to me that maybe those early theologians were on to something. Maybe it is a sin to kill a man, even in a just war. Maybe the GJP people are right when they tell me that I always seem to speak the Ten Commandments but never the Beatitudes. Maybe I do need to wake up and listen to some of the words that Christ has taught us: "Blessed are the Peacemakers, for they shall be called the Children of God." "Love your enemy and pray for those who persecute you." "Let he who has not sinned cast the first stone." Maybe I ought to have been there with them, silently kneeling and praying at the Career Fair. Maybe I should join them in November when they travel to Georgia to keep watch at the School of the Americas. At the same time, I recognize that we live in a world full of evil men; I recognize that we are at this very moment locked in a battle with the forces of oppression and tyranny; I recognize that there are extremist Muslim terrorists who would rather destroy the world than let freedom and democracy flourish. I know that this battle will not be won by putting down our guns; I know that these men are so depraved that the language of peace and justice means nothing to them; I know that the call to spread peace in the world is now the call to stand and defend ourselves against the annihilating powers of extremism and terrorism. But I pray nevertheless that the day may soon come when we will be delivered from these present evils; when we can put down our guns and embrace each other not as men divided by differences of race or creed but as men united in our common humanity; when the Peace of God will reign in our hearts, filled with love for that singly precious gift that He has given us: human life. Than what we'd first begun. 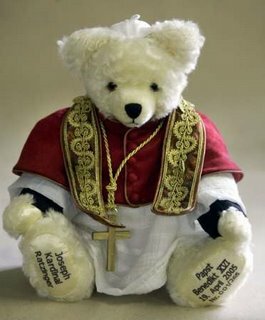 While using Google Image Search yesterday to find a nice picture of Pope Benedict XVI for an article on him in the next issue of The Observer, I came across this wonderful item. Even I had to squeal, "How cute!" Pope Benedict XVI on Sunday praised an Italian nun for pardoning her killers as she lay dying from an attack in Somalia that may have been linked to worldwide Muslim anger over his recent remarks about Islam and violence. Rosa Sgorbati, an Italian missionary who worked in a pediatrics hospital in Somalia under her religious name Sister Leonella, was slain in Mogadishu Sept. 17, the day that Benedict said he was deeply sorry his remarks had offended Muslims. The pontiff has also stressed that the words he spoke, a citation from a Byzantine emperor in medieval times, did not reflect his own opinion. Speaking Sunday about the need to overcome selfishness, Benedict cited the slaying of the nun in Somalia, where she had worked as a nurse. "Some are asked to give the supreme testimony of blood, as it happened a few days ago to the Italian nun, Sister Leonella Sgorbati, who fell victim to violence," the pontiff said. "This nun, who for many years served the poor and the children in Somalia, died pronouncing the word 'pardon,'" the pope told pilgrims during his traditional Sunday noon appearance. "This is the most authentic Christian testimony, a peaceful sign of contradiction which shows the victory of love over hate and evil." Guy 1: Hey man! Jen said she's bringing four female friends over tonight! Guy 2: From her floor? Guy 1: No, they're from out of town. Guy 2: Awesome! Fresh meat! "Fresh meat"? This is why feminists should be mad. Most people would peg me as being a little on the conservative side to identify with feminists, but when a man refers to a woman (or to women in general) as meat, my blood boils. One could describe me as a feminist, but in this sense, I'd prefer to be called a humanist (though not of the secular bent). My blood boils just as much when women refer to men as "meat", or as anything, for that matter, that objectifies them and reduces them from their full dignity as men - or I should say, human beings. It is a dangerous characteristic of our so-called "enlightened" society that we yet fail to recognize that every human being (and that includes the unborn) is as much a human being as any other, and ought to be accorded therefore all rights, privileges, and honors pertaining thereto, for each one is, like you and like me, made in the image and likeness of God. This is the dignity of the human person, and it is vital that we come to respect that dignity in every one of our neighbors as in ourselves. I cast my eyes about, and they fall upon the television and an episode of "Desperate Housewives"; they fall upon a magazine rack and the latest issue of "Cosmopolitan"; they fall upon my email inbox and ads to see the latest teen hottie strip for me: why? Why do television executives need to show me that women must sleep around and get mixed up in strange murder mysteries in order to be happy? Why do magazine executives need to tell me all about 101 things that will turn a man on? Why does website after website force a girl barely out of high school to degrade herself to the lowest levels to earn a few dollars? And why, above all, do we respond to the television, magazine, and website executives with a throaty "Yes! I want to sexually objectify women!" Though American culture suffers under this particular brand of dishonoring its fellow man, yet, the problem is not fundamentally one of placing the woman's flesh above her humanity. In the East, especially in the oppressive, extremist Islamic regimes, a woman's humanity is annihilated beneath a dark veil, not only of fabric but of denial of rights. A woman is not a human to the extremist Muslim man: she is an object, a piece of property to be bought, sold, and used as he sees fit. And honor? Her only honor is such that if it is violated, she is liable to be killed for it. This question passes even the gender divide and enters into the womb. Western culture has seen fit to rob the child in its womb of its humanity: the child who is at that moment most defenceless and most dependent on others has yet its only defence stolen away - its worth as a human being. We, and by that I mean every human being on this face of this good earth, must find it within ourselves to see our own worth in others: otherwise, I fear that we are doomed. For what reason have I to love, cherish, and protect my neighbor, and by that I again mean every human being on the face of this good earth, except that I first recognize that he is worth loving? Guy 1: Tonight's gonna be awesome! Guy 2: We're gonna get smashed! Every Monday morning as I walk along Commonwealth Avenue on my way to campus, I usually pass several piles of dried vomit from the revelry of the weekend. While trying to swallow down my own wave of disgust at the thought that that vomit on Monday may belong to Guys 1 & 2, I started to wonder why it is the same every Monday morning. Why is it that Boston College students seem to enjoy getting so drunk that they have to vomit? Why do they insist on doing so not once, or even twice, but week in and week out for the entirety of their time here? What possible factor could induce them to down so much alcohol that their bodies must revolt or face damage? What appeal do repeated heavings, in the toilet, in the bushes, on the side of the road, have? Why is the singular goal of many Boston College parties to get so tanked that when you wake up the next morning, you can’t remember what happened? Do they enjoy getting so plastered that they will jump into the next available Senior’s bed? Can someone please tell me why one can’t drink just one beer, but must drink 10 or 20? I invite any college student who reads this and can answer these questions to post a comment and explain it to me, since frankly, I don't get it. "Violence is incompatible with the nature of God and the nature of the soul." (Note: I highly recommend that you read the entire text of the speech, for as we all know, words taken out of context can be twisted and manipulated to the vilest ends). "We tell the worshipper of the cross (the pope) that you and the West will be defeated, as is the case in Iraq, Afghanistan, Chechnya," said an Internet statement by the Mujahideen Shura Council, an umbrella group led by Iraq's branch of al Qaeda, according to the Reuters news agency. "We shall break the cross and spill the wine. ... God will (help) Muslims to conquer Rome. ... God enable us to slit their throats, and make their money and descendants the bounty of the mujahideen." They are outraged that the Pope should decry the spread of Islam by the sword, and so they threaten precisely that: to spread Islam by the sword. My real point, however, is not to point out the hypocrisy of the jihadists: their hypocrisy and irrationality is well known to all rational people of this world. What I want to stress is this theme which the Pope laid bare: Violence is incompatible with the nature of God and the nature of the soul. When we say the Prayer of St. Francis, we ask God to make us instruments of Peace - we ask him for nothing more than that he fulfill our basic Nature: we were made in the Image and Likeness of God, and so we, too, in our very nature, abhor violence and uphold peace. Unfortunately, we seem to have lost that innate desire for peace, and rather rage in war than strive to establish peace amongst ourselves and with all peoples. Have we not learned in the last 2000 years that blessed are the peacemakers? Have we not mourned the carnage of war waged through the history of the world for our own greed? Have we, a world of one common humanity, not understood that the destruction of one life is the destruction of a little piece of all? Please pray for our parishioner John Clark, his wife Gayle, and their daughter Sara. John suffered a seizure - subsequently a tumor was discovered in his brain. The doctors have said that the tumor isn't the 'originating' place for this cancer. So they're gearing up for full body scans - the prospect of this is frightening. Deus, qui omnipotentiam tuam parcendo maxime et miserando manifestas, potestatem medicam tuam super tuum famulum, Johannem, infunde, et solatium per gratiam tuam super familiam eius, ut, ad tua promissa currentes, et terrenorum et caelestium bonorum facias esse consortes. Per Jesum Christum Dominum nostrum, qui vivit et regnat Tecum in unitate Spiritus Sancti, per omnia saecula saeculorum. Amen. In an attempt to convey some of my experiences while studying last semester in Germany, I intermittently sent emails to some of my family, which found their way around various communities. Some have expressed an interest in receiving more of those email messages. Though I am no longer in Germany, I've still plenty to say, and this blog seems a much more efficient way to effect the dissemination of my thoughts (however few they may or ought to be) to those (however few they may or ought to be) interested in them. What, then, will fill this blog? It will be, as any good blog is, a presentation of my thoughts and experiences, both quotidian and extraordinary, which have formed themselves into sentences and texts in my mind. Sometimes it will be simple observations; at others full treatises; and again, it may simply record the random events and questions which constitute my interaction with myself and the world. As its title would indicate, this interaction consists primarily of the experiences of a faithful Christian seeking to understand his Faith and the world in which he exercises that Faith, both the internal world of his soul and the exterior world with which his incorporated soul interacts. The questions of humanity remain as they were in Homer's time: What is justice? How do we enact it? What is the Good? How do we live the good life? My Christian Faith finds these questions both asked and answered in Christ: in the manger, on the Mount, on the Cross, and out of the tomb. Humanity is fully realized in the Incarnation, and so in the Incarnation is found the resolution of humanity's doubts. Anselm proposes in "Cur Deus Homo" that the Incarnation and Christ's Obedience on the Cross were (and are) the necessary satisfaction of humanity's debt of sin against God, a satisfaction through which the Divine Plan for Man - blessedness - can be fulfilled. When God created man, He created us to be blessed; that blessed nature was marred by our sin; and in the Incarnation, the order of blessedness is returned out of the disorder of sin: it befits the true human nature to be perfectly blessed as Christ's human nature was perfectly blessed "by taking of the Manhood into God" (Athanasian Creed). To put it simply, God became Man "Ut Homo Deus": "That Man might become God." Yet, in the world of practice, in which we men are frail and fallible, this realization of humanity is anything but simple. Paradoxically, my purely simple Faith in the Folly of the Cross has been greatly deepened during my time of study at Boston College and abroad; while my recognition of the greatest complexity of the practice of the Faith in the world has grown ever clearer. As I enter my Senior year, I perceive ever more acutely the chasm between the heights of humanity reached by the grace of God and the depths of depravity into which we fall without Him. I recognize especially that this year, my faith is stronger than it has ever been before; and that the world will test it more than it ever has before. I invite you, reader, to join me then on this journey to what ultimately we might call virtue: at one time to seek the summit of divinity, and at another to pursue the middle road between the vices of pride on the one hand and despair on the other. Can I promise that such unity of purpose will be found in every post? No. Yet every post will reflect in some way this journey, for as God is omnipresent in and out of this world, within and outside of time, so too is one ever on the road leading either to or away from the realization of one's humanity. I can never leave the journey, even in death; but then, why would I want to?